Happy New Year my readers, the Fur Guru returns! 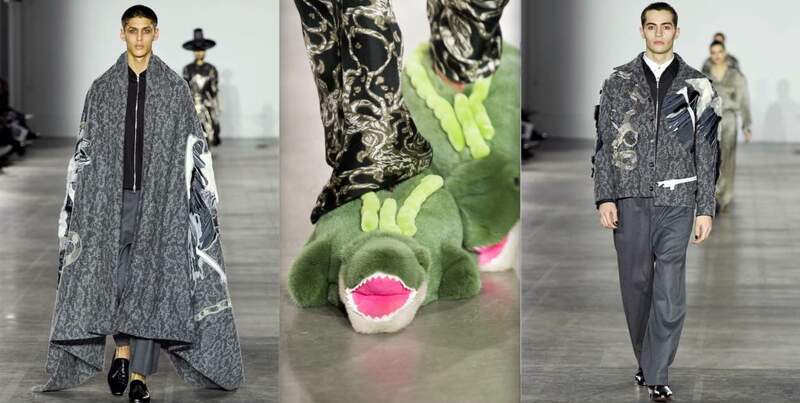 And O-boy, do I have a London Fashion Week exclusive for you to sink your teeth into. London Fashion Week Men’s kick-started 2019 magnificently for the Guru. A couple of days of shows, dinners and parties kept me busy from dawn to dusk, and now, while I unwind and reflect on my week, there’s one show that cannot escape my mind: Edward Crutchley. On the opening day of LFWM Autumn/Winter 2019, I sat front row during Edward Crutchley’s fashion show where my eyes feasted like never before. Crutchley’s collection, teaming with loosely tailored pinstriped trousers, rich cashmere knitwear and fur embellished jackets, capes and slippers (which stole the show, of course!) was modelled by a selection of both men and women – something which is becoming increasingly popular with designers. Crutchley’s elegant collection, infused with avant-garde accessories, did much to subvert gender boundaries and revive my love of natural fur. Inspired by traditional Korean headgear, and Japanese and American 80’s sportswear, Crutchley’s show fed my appetite for art and the abstract. A flood of deconstructed animal prints, a range of natural furs, and a muted colour pallet transported me to the plains of Africa and the concrete mazes of London, Beijing and New York at the same time. While these two influences are diametrically opposed, they worked in majestic symbioses in front of me (and a front row of fashion editors and influencers). A selection of duck and crocodile slippers and the most majestic fox fur and shaved mink slides gave Crutchley’s formal business attire major bite. Playful, yet provocative. Formal and informal. The guru wants for more his juxtaposing beauty. 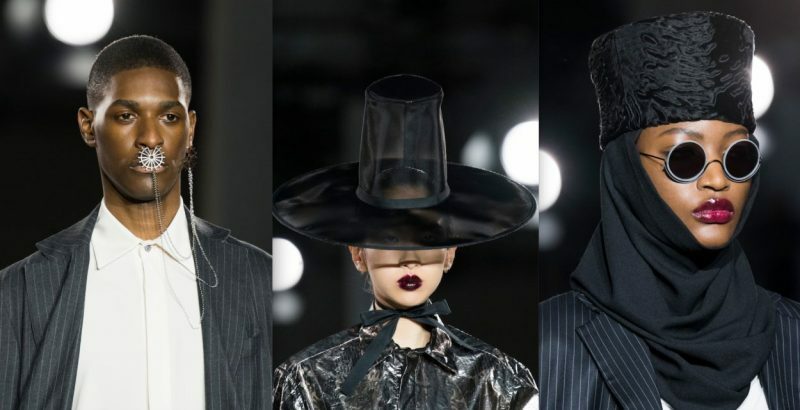 Nose rings, swakara fur hats, and Stephen Jones’ wide-brimmed witch’s hats decorated Crutchley’s blazers and kimono-esque coats which float past to the sound of rain that flooded the runway. Designs of black and grey, and every shade of silver and charcoal in-between, marked a return to modernism. While injections of vivid and elaborate bird embellishments, so delicate and realistic they appeared as if they could almost come to life at any moment, made Crutchley’s collection came to life. I bathed in Crutchley’s unapologetic use of fur, a clear rejection of the mainstream in favour for natural beauty. It has been years since the Guru has been lost for words, and I’m not sure when another designer will have the same effect. But what I do know is the clean classicism of Crutchley’s silhouettes infused with the beauty of the natural materials he used, like fur, wool and silk, means the Fur Guru begins 2019 with a sense of optimism for fashions future.